This prose translation of twenty-four lays from the French Middle Ages brings to the general reader as well as to scholars a complement to the twelve well-known lays by Marie de France, the possible creator of the genre. These lays are mostly anonymous, and the majority, but by no means all of them, are, like Marie’s lays, centred on a love interest of some kind in a variety of settings. But, unlike Marie’s lays, their treatment varies from the courtly and sophisticated to the comic or the tragic, thereby illustrating the range of poems covered by the term lai in twelfth- and thirteenth-century France. A significant number of these lays, based in the courtly world, contain supernatural elements or magic objects that are fundamental to the story as it is related, and sometimes the heroes leave the real world to dwell forever in an otherworldly domain. Other lays have a more mundane feel to them and seem closer to the fabliau in tone. In one instance, the lay of Haveloc, the tale owes more to legendary history than to pure fantasy. 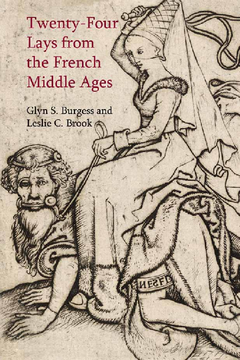 Overall, this collection stakes a claim to make an important contribution to the Medieval French lay within the wider European tradition of the short story and the literature of love.